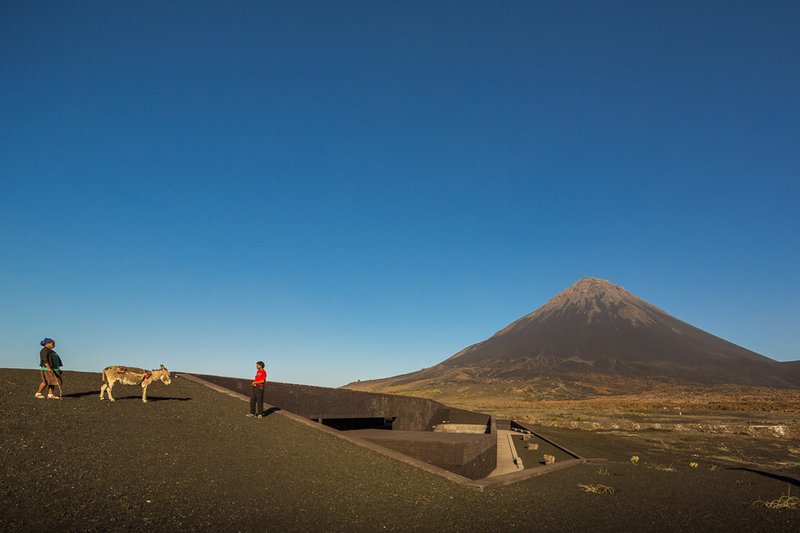 Fernando Guerra's photographs reveal a low bastion sprawling over a dust-and-red scrub landscape, built of the same volcanic rock which composes the island. Servicing park, locals, and visitors alike, Oto arquitectos' Fogo Island Natural Park Headquarters is a wonder of locally-sourced inspiration and construction. 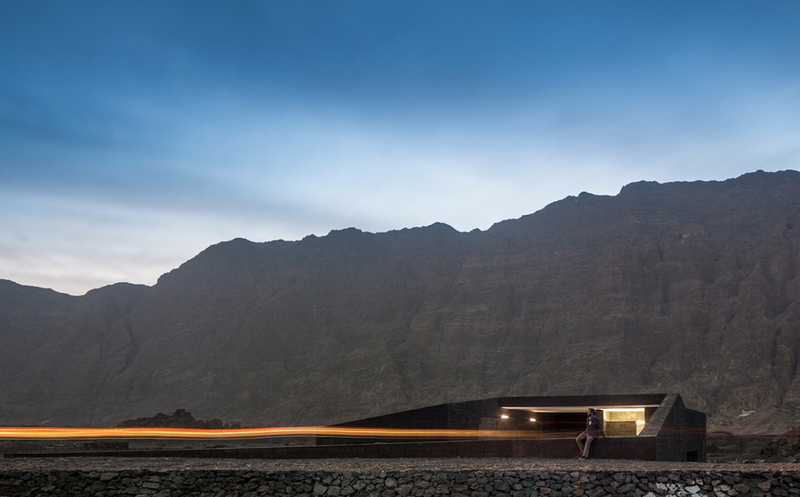 Fogo Island Natural Park in Cape Verde stretches out like a moonscape dusted over with ash. At 1800 meters in the lip of a volcano, 1200 men, women, and children subsist via basic agricultural practice. The village of Chã das Caldeiras occupies state land in one of Cape Verde's poorest regions. Oto arquitectos' new project is a headquarters for the park, serving both to mediate relations between existing residents and new park management, while synthesizing the park's identity into a central structure. The building's practical function, too, is duo-fold. On one hand it is an administrative building. The design incorporates meeting rooms, offices, laboratories, and technical maintenance areas behind a glass façade that might appear among dozens of others in Silicon Valley. Yet the overall structure is necessarily multifunctional and distinctly local, created via local construction methods by the island's residents, and consisting of the same volcanic rock which forms the island. The rock is porous - a smoky gray - and cut into elongated bricks for the building. The architects describe the building as constructed to fit the landscape, a "melting of darker skins" as it were. Its low-slung walls meld brick by brick into the craggy background of volcanic rock. 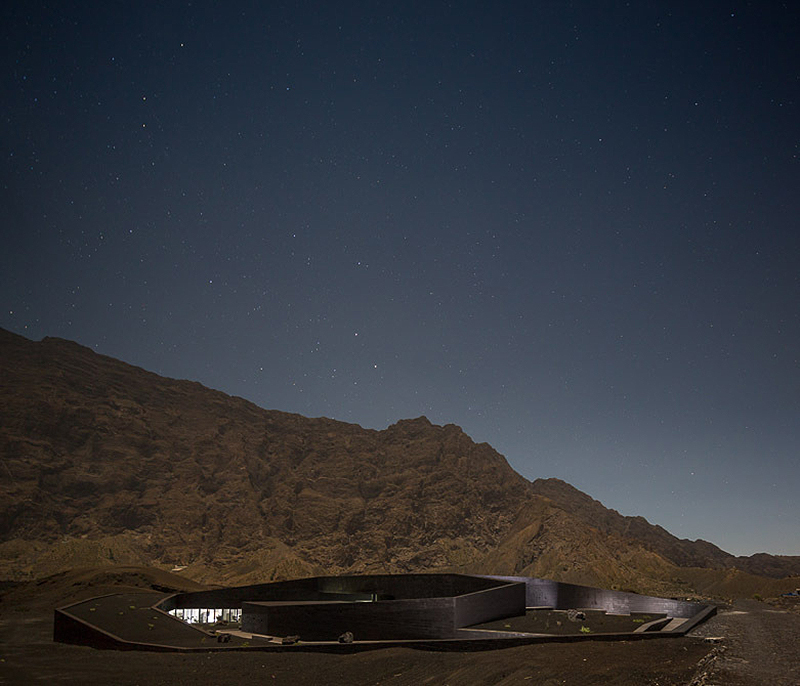 The slope of the building plumbs downward into the earth, mirroring that of a nearby volcanic peak. It is a connection to and representation of internal activity bursting up from the earth; there is the same potent energy in this building as that which formed the volcanic island. Though it may appear like a desert bunker - low, isolated, and hard-edged - noted photographer Fernando Guerra's images reveal the space's other purpose: as a cultural space. Here, the space comes alive with the multicolored flags of humans interacting with the structure. Community drives the creation of modern amenities including a covered auditorium, library, terrace bar, and an outdoor auditorium, but also reveals itself in local musicians, hay-laden donkeys, and toddlers on bikes. Eco-scaping pays homage to native flora. A zen-like courtyard floats blackened boulders and feathery green shrubs on seas of crushed rock. Even the lighting of the building is made indirect at night so as not to disturb native birds. Cape Verde, an island which was for many years a Portuguese colony is no stranger to resource shortage; hence the local construction and materials. The building also takes advantage of plentiful sun; it is energy dependent via a network of solar panels glazing the roof. The roof also serves to collect water, which is then stored in a repository along with water collected after the rainy season. Beyond the local and environmental respects payed by the architects, the building is significant as a structure made specifically for its visitors. It is no artifact landed in an ashy vacuum but a locus of community. 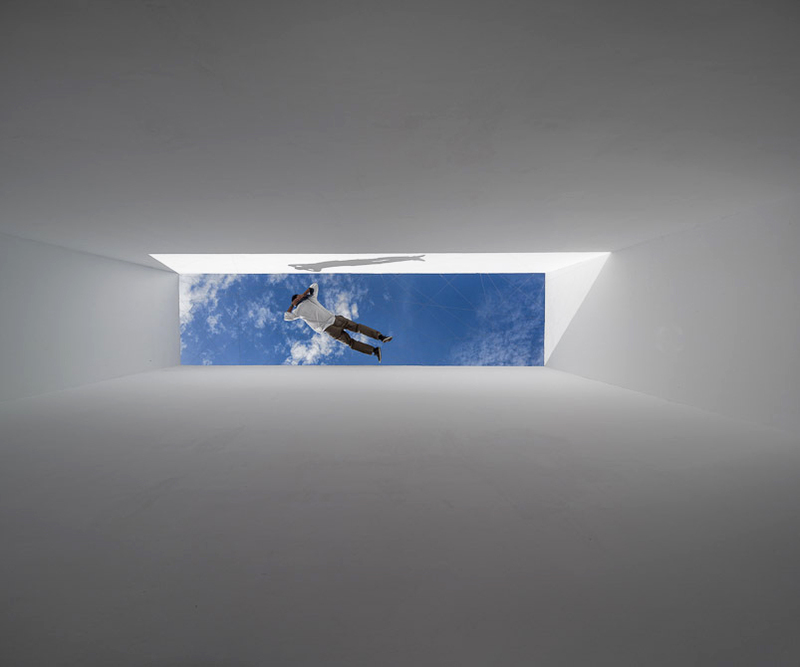 Among Fernando Guerra's gorgeous images are snapshots of human life: a man peering through a port-like window, two silhouetted children playing atop a set of stairs, a couple strolling along the roof with a donkey moseying behind. The structure importantly works to break down disparities between government and locals. Guerra makes a strong argument for not only the beauty of its setting but the practical interaction between local Cape Verdean and the park's administration. Here, the concept of the architect, the practical need of the government, and a deference to the landscape and its denizens all meld into a truly functional and beautifully minimal building.